Here to confirm: ya can’t. We open on witty, ambitious food blogger Mele Bart, a single mother living in San Francisco with two-and-a-half year old Ellie, her “wonderful mistake.” After many failed trials hanging out with the mothers of San Fran, Mele has finally found her people, her unofficial playgroup. And she’s working on a questionnaire—her entry to The San Francisco Mothers’ Club Cookbook Competition. Mele uses stories from her friend’s lives—good, bad, and ugly tales of motherhood, fatherhood, dating, marriage—to inspire recipes for the questionnaire, and she does not hold anything back. I’ll let Kaui herself tell you the rest. KM: So first things first. How would *you* describe what this book is about? KHH: It’s about a single mother, trying to raise her child while simultaneously trying to raise herself—to become an adult—to find friendship, her passion, her way. KM: What’s the origin story of this novel—what was the first thing (character, moment, theme, whatever it was) you came up with and how did the story evolve from there? KHH: There are so many origins. I started writing a blog as a creative outlet when my daughter was around two. A few of those blog posts are in this book. I was part of a mother’s group and I’d save some of the comments from the online forum. Many of those are in this book. I wrote short stories about parenthood. That’s here. I had to fill out an Author Questionnaire for a previous novel, which sparked the idea for the structure of a short story, which later became the structure for this novel. All of this happened when I was a new mom, and only until time passed did I look back, gather, and create a character, premise and structure to turn the tidbits into something whole. KM: I don’t want to conflate you with Mele, but you do mention the “real playgroup” in the Acknowledgements, so I have to ask…how much of this book is true to your experience as a new mother in San Francisco? What did you like about San Fran, and why did you eventually decide to move back to Hawaii? KHH: So much of it was informed by my own experiences as a new, young-ish, mother in a place where I didn’t know anyone with children. Like Mele, I forced myself to get out there and interact with this new world, and in the process, note the absurdities, the wonders, and frustrations. I loved San Francisco, and sometimes wished I could have raised my son there. There are so many opportunities for moms just like Mele, who don’t know a soul. We moved to Hawaii nearing that time when school was coming in to play, and many people have their eye on the suburbs. My husband got a great job offer, and we wanted to be around family. And we wanted a yard and a garage. KM: As I said in my Instagram (ha), I totally relate to this line from Mele: “I am also interested in television and not in an ironic way. Certain shows on Bravo make me say out loud: “My God, I love America.” Is this a sentiment you share? What shows do you watch? KHH: Yes, my brows are all over the place. I go high, I go low. I love Don Lemon and Rachel Maddow, Joy Ried, love Real Housewives (especially NY). Transparent is brilliant—The Affair, Billions, Game of Thrones—I love it all. KM: I’m always interested in what authors think of the comp titles their publishers come up with. When I started reading I couldn’t help but think about Where’d You Go Bernadette (which I loved), but how do you feel about your books being compared to other books? Does it bother you, do you find it flattering, etc? KHH: I’ve never been compared to something I haven’t liked. And Where’d You Go Bernadette is a highly flattering comp title. KHH: It really doesn’t. After I’ve written then, sure, I’ll entertain the thought. How about Zoe Kravitz and Justin Theroux? Ewan Mcgregor? KM: How are things going with The Possibilities? Can you tell us where you are in the process, or anything about working with Jason Reitman? KHH: I’m looking forward to it—the book is still under option. KM: What’s next for you? Would you return to YA? KHH: Yes, I think I have another YA story left in me. 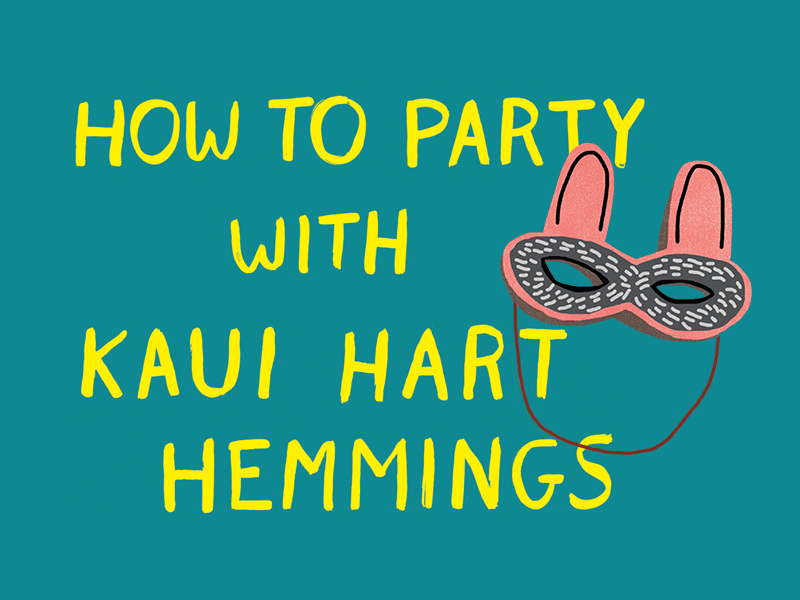 Get your copy of How to Party with an Infant from Amazon, B&N, or Indiebound, and keep up with Kaui on Facebook, Twitter, and Instagram.